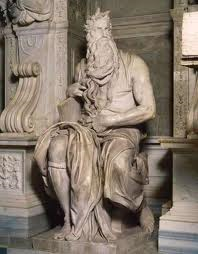 The Moses sculpture is a large figure nearly eight feet tall. Moses is shown with muscular arms and an angry intense look. He has the tablets with the Ten Commandments under his arm that he just received from his encounter with God on Mt. Sinai. The figure shows Moses’ pent up energy. Many say he is angry after seeing the Israelites worshiping the golden calf. In comparison to other seated sculptures, Michelangelo’s work is far more lifelike, powerful and full of energy.